YOUNG PEOPLE WHO watch one extra junk food advert a week (over the average of six) consume an additional 350 calories in foods high in salt, sugar and fat every week, according to a new study. This equates to an additional 18,000 calories each year, according to the largest study of its kind in the UK, which involved more than 3,300 children and teenagers aged 11 to 19 years. The study, which was conducted by Cancer Research UK and was presented at the European Congress on Obesity (ECO) in Austria this week, adds to the growing evidence that TV and streaming adverts can influence young people’s unhealthy diets. “Junk food marketing is associated with obesity in young people of all ages, and we know that obesity is linked to at least 13 types of cancer,” Dr Jyotsna Vohra, head of the Cancer Policy Research Centre which led the research, said. Levels of obesity in young people aged between 12 and 19 years tripled in the USA (from 5% to 17.6%) between 1980 and 2008. Similarly, in England around a fifth of children in the last year of primary school (aged 10 to 11) is obese. According to research published in The Lancet medical journal last year, 9% of Irish girls and 10% of Irish boys are obese. Obese children are around five times more likely to become obese adults, with a much higher risk of health problems including 13 obesity-related cancers, type 2 diabetes, and cardiovascular disease. 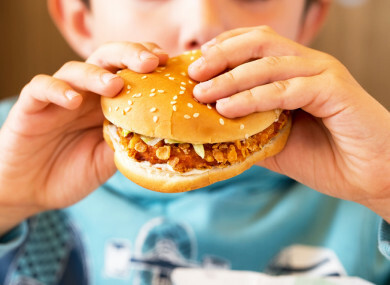 Although the causes of obesity are complex, previous research has found strong links between an increase in advertising for fast food and rates of childhood obesity. An earlier Cancer Research UK study showed that teenagers who report watching three or more hours of commercial screen time (television or streaming) a day are twice as likely to consume large amounts of unhealthy food, compared with those who watch less than three hours a day. In this study, Dr Vohra and her Cancer Research UK colleagues surveyed a national sample of 3,348 young people aged 11 to 19 years to further examine the link between marketing and high calorie diets. Participants were asked about their age, gender, ethnicity, socioeconomic status, food and drink consumption, and TV and online viewing habits. On average, young people watched 21 hours of television a week with adverts, with just over half of this time viewed on streaming platforms. However, obese participants watched significantly more television — around 26 hours (equivalent to one extra advert a week). On average, young people reported eating almost 30 food items each week that were high in fat, salt and sugar (HFSS) – equivalent to 40-50% of this age group’s recommended total calorie intake – but only 16 portions of fruit or vegetables. Overall, results showed that the more junk food ads young people watched, the more unhealthy foods they were eating. All participants were able to recall a favourite television advert for unhealthy food, and were particularly influenced by adverts that were fun, targeted, age appropriate or catchy. The researchers found that greater familiarity with fast-food marketing was associated with eating more foods HFSS and increased weight, regardless of age and gender. However, those from a more deprived background were more likely to recall HFSS adverts than those who were not. “This combined with their already greater risk of unhealthy weight outcomes suggests that young people from deprived backgrounds would potentially have the most to gain from regulation designed to reduce junk food ad exposure”, Dr Vohra explained. The authors acknowledge that their findings show observational differences, rather than evidence of cause and effect. They note some limitations, including that the study is based on a self-reported survey of viewing and eating habits which can lead to problems of recall and could have affected the results. Email “Children who watch extra junk food adverts consume more calories”. Feedback on “Children who watch extra junk food adverts consume more calories”.